The New York City Department of Environmental Protection (DEP) announced today the installation of new signs at stormwater (MS4) outfalls along Coney Island Creek in Brooklyn. The new signage was installed at eight locations to notify residents of the presence of an outfall and prompting them to contact 311 with an outfall ID number, should they observe discharge after a period of dry weather. This pilot is one of many efforts to continue water quality improvements in Coney Island Creek and was developed with input from the community after a series of workshops with the Coney Island Beautification Project, the SWIM Coalition, Partnerships for Parks, NY Aquarium, and meetings with Brooklyn Community Board 13. DEP continues its ongoing efforts to protect and improve the water quality in Coney Island Creek through its Illicit Discharge Detection and Elimination (IDDE) program. The agency implements multiple monitoring programs including a Harbor Survey, Sentinel Monitoring, Shoreline Survey, Field Sampling Analysis, and reviews data collected by citizen scientists. When data shows elevated pathogen levels, the City conducts investigations to track down the source. Between 1998 and 2017, more than 400 properties surrounding Coney Island Creek were investigated and 92 illegal connections were discovered by DEP in apartment buildings, one-two-and-three family houses, and commercial properties, and subsequently abated under orders. “We commend DEP for their response to community requests for signage on Coney Island Creek to help build awareness of illegal sewer discharges into the Creek,” said SWIM Program Manager Julie Welch. “The workshops and the resulting signage are a great example of government and community working together to improve the health of our local waterways. We look forward to the day that Coney Island Creek is free of illegal discharges. New York City is launching this pilot program in connection with its MS4 Program which aims to manage urban sources of stormwater runoff to protect and improve water quality. When it rains, stormwater that flows over streets and other impervious surfaces, can sweep up pollutants such as oils, chemicals, pathogens and sediments. For areas of the City such as Coney Island, that primarily served by the MS4 (municipal separate storm sewer system), the pollution carried by stormwater runoff is discharged directly into the City’s waterways, which can have a negative impact on water quality and recreational uses. To address this, the City is currently developing a comprehensive plan to prevent multiple types of pollution from entering our waterways. In the summer of 2017, the City launched the “Don’t Trash Our Waters” campaign in Coney Island to encourage residents to properly dispose of litter before it can reach local waterways. DEP will be partnering with NYC Parks this year to install pet waste bag dispensers in Kaiser Park to minimize the presence of exposed pet waste. When park goers properly dispose of their pet waste, it reduces the amount of plastic bags that can end up in catch basins and be flushed into Coney Island Creek when it rains. 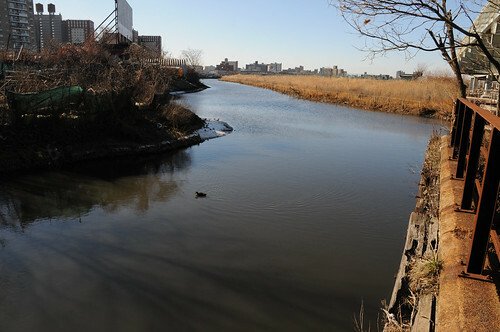 The City is also working to identify potential sites for green infrastructure opportunities, which will collect and filter stormwater runoff before it enters the sewer system, and aims to implement green infrastructure pilot projects at select parks, schools, and NYCHA properties in the Coney Island Creek MS4 area. Over the last decade DEP has invested more than $12 billion in upgrades to wastewater treatment plants and related efforts to reduce combined sewer overflows and testing confirms that the water in New York Harbor is cleaner today than it has been in more than a century. In 2015 DEP also announced the completion of an extensive $210 million rehabilitation and upgrade of the century-old Avenue V Pumping Station in Gravesend, Brooklyn that has substantially improved the health and cleanliness of the waterway. The refurbished facility has the capacity to pump 80 million gallons of sanitary and stormwater flow to the Owl’s Head Wastewater Treatment Plant each day, more than 150 percent more than it could before the upgrade. This has resulted in a reduction of sewer overflows into Coney Island Creek by nearly 90 percent. DEP manages New York City’s water supply, providing approximately 1 billion gallons of high quality drinking water each day to more than 9 million residents, including 8.5 million in New York City. The water is delivered from a watershed that extends more than 125 miles from the city, comprising 19 reservoirs and three controlled lakes. Approximately 7,000 miles of water mains, tunnels and aqueducts bring water to homes and businesses throughout the five boroughs, and 7,500 miles of sewer lines and 96 pump stations take wastewater to 14 in-city treatment plants. DEP has nearly 6,000 employees, including almost 1,000 in the upstate watershed. In addition, DEP has a robust capital program with $18.9 billion in investments planned over the next 10 years that will create up to 3,000 construction-related jobs per year. For more information, visit nyc.gov/dep, like us on Facebook, or follow us on Twitter.